As a Master Saddler and a Member of The Society of Master Saddlers, my promise is that any piece commissioned will exceed your expectations in quality. I've been running my bespoke bridlework business and repairs service since the Autumn of 2000 and have continually built on my skill sets and education since then. A summary of my accreditation is below. 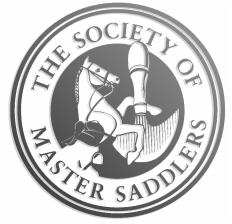 I became a Society of Master Saddlers Registered Qualified Saddle Fitter. Due to quality of craftsmanship, qualifications gained and having completed enough years in the saddlery trade I was accepted as a Master Saddler. I gained my Society of Master Saddlers Flocking and Flocking Adjustment Qualification. I gained my City and Guilds Level 3 Harness Making. I gained my City and Guilds Level 3 Saddle Making. I gained my City and Guilds Level 2 Saddle Making and Level 3 Bridle Making. I gained my City and Guilds Level 2 Harness Making. I gained my City and Guilds Level 2 Bridle Making. I took my City and Guilds Level 1 Saddlery. I trained at Cambridge and District Saddlery Courses and completed certificates in Saddle Repair and Flocking, Basic Bridlework and Advanced Bridlework. Alongside the business I continued to add to my skills by training with a local Master Saddler and Mark Romain at the Saddlery Training Centre.